What is available flat size in Sunshine LA Grand? Flat sizes in the project range from 1260.0 sqft to 1835.0 sqft. What is size of 2 bhk in Sunshine LA Grand? 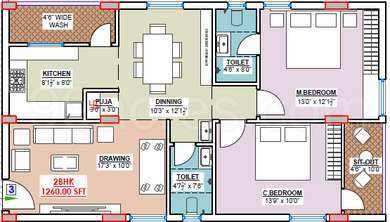 The area of 2 BHK apartments is 1260.0 sqft. 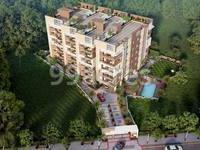 What is total area of 3 bhk in Sunshine LA Grand? 3 BHK units in the project are available in a size of 1500.0 sqft to 1835.0 sqft. What is total size of Sunshine LA Grand?The project is built over an area of 1.53 Acres. What is the price of 3 bhk in Sunshine LA Grand? 3 BHK units in the project are available at a price tag of Rs. 7498500 to Rs. 9173165. 6 Persons capacity Lifts of reputed make. Sunshine Group is a renowned real estate developer in Hyderabad. Following the motto of 'Design, Construct, Deliver', the company has delivered numerous prestigious projects. Core values of the group are innovation, quality, trust and collaboration. The company is driven by the vision to excel in the real estate industry by delivering exceptional residential and commercial projects. It strives to create a niche for itself in the real estate industry and cater to all segments across the country with trailblazing record.